Commercial buyers have a special need when it comes to choosing a concrete supplier. We at Concrete By Design understand the need to respect the client’s budget and time as well. Drivers are on time and courteous to your crew. We service parking garages, parking lots, warehouses, and even retail spaces and can supply specific mixtures necessary for your commercial project. Our trucks can provide transit mixed concrete, shrink mixed, or central-mixed concrete. Whatever the need is, we are here to serve you! A special ready mix is required for parking garages. It must be able to support the weight of hundreds of parked cars, the moving force of various sized vehicles, even some on an incline, and maintain without buckling. This special mix needs to have a lightweight property to maintain its lift and the strength needed to support such heavy loads. Another key factor is supportive rebar, which gives additional aid in the maintenance of the concrete. Industrial-grade concrete is also essential. 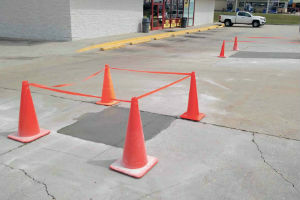 To make a good impression on your customers and maintain safety, it is important to have a smooth surface in your parking lot without cracks or potholes. Commercial parking lots receive an elevated level of traffic from lightweight vehicles, so less concrete is required than it would be for a parking lot that has heavy traffic from larger vehicles. 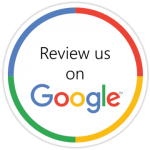 If you want to make the most cost-effective decision, we can assess what you need and recommend what is best for your needs. A warehouse floor is a place that should be free of safety hazards and support a large amount of heavy material. Any cracks, dents or bumps can cause a tripping hazard, as well as hindering equipment necessary to perform job functions, such as forklifts and dollies. Concrete By Design can fit the needs you have with your warehouse, with quality product and professional work. If you have a retail space, you most definitely want a durable and attractive looking floor space. Concrete By Design has the ability and the know how to deliver the right kind of concrete for your flooring needs. Before you dismiss the idea, consider the multiple finishes and color options available. Imagine your space with a fashionable brick or even cobblestone appearance. Smooth finishes and easy to clean concrete flooring will give your retail space a visual appeal and a cost-effective, lasting floor that will withstand use. We do Concrete Repairs TOO!!! Concrete By Design can work with you for whatever you need, clearing the land, soil preparation, and leave you with a durable concrete structure and a clean site as well. 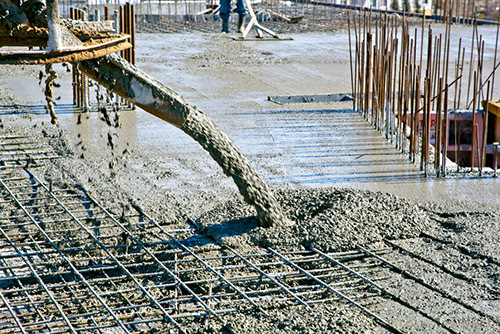 You can rest assured knowing our crew will work diligently to ensure quality, affordable concrete delivery for all your commercial needs. You can trust us to get the job done right, from land prep to pouring the concrete all the way to cleaning the job site afterward. So, for all your commercial concrete needs, look no further than Concrete By Design!